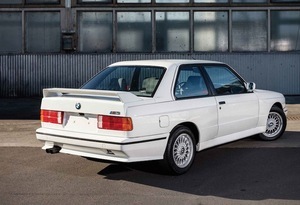 Behold: the 1988 BMW M3 – one the outside, a pumped up Reagan/Bush era E30 with big wheels, flared arches and a rear spoiler. 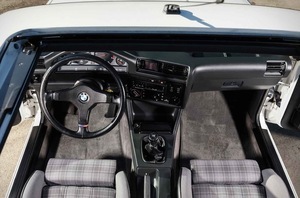 Inside, A 194bhp, 4-cylinder S14 engine that made it a rally and road racing legend. This model, in mint condition and with low mileage, retains its original (albeit not to everyone’s taste) white-over-grey tartan interior. Yours today for between €65,000 and €95,000. 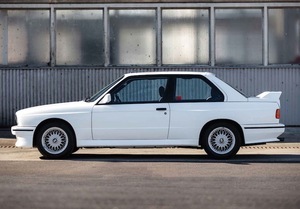 Posted in Design and tagged BMW M3 at 4:52 pm on April 12, 2019 by Chompsky. 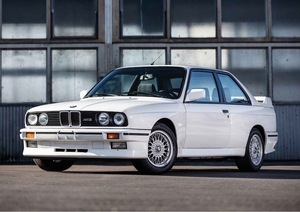 that era M3 is utterly revered in car circles but I agree. Get it… bit of a stretch… I’ll get me coat. You seem upset hun, need a hug? Looks like a blingy version of yer da’s car from the 80s. Awful.